Australia celebrates the Queen’s Birthday as a public holiday on the second Monday in June. Back in January Dawn, one of Gail’s teaching colleagues, and her husband Doug had promised to take us along on a camping trip to the Outback for the long weekend holiday in June. Dawn and Doug had advised us that June would be a good time to travel in the Outback because the winter clime would be more bearable than the searing hot summer temperatures. As well, the pesky flies would be much more tolerable to bear during the winter season. In eager anticipation, our bags were packed and we left immediately after school, on Friday of the long weekend. Our destination that night was a Sheep Station located near Craddick which is approximately three hours driving time from Kadina. In Australia, sheep stations can range up to thousands of square kilometres in size with variable sheep stocking rates depending upon pasture conditions. Sheep stations are not like our farms….sheep stations are huge! The Sheep Station we visited is owned and operated by Andrew and Joy, who are dear and life long friends of Doug and Dawn. After a couple of hours of “catch up time”, teasing banters, and fond reminiscences between the two couples, we bedded down in the Shearers’ Quarters. 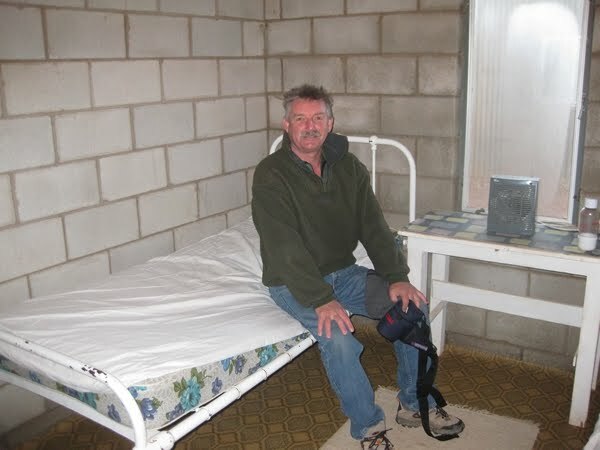 Shearers’ Quarters are temporary living facilities that each Sheep Station provides to house transient sheep shearing teams. Throughout the year, sheep shearing teams travel across Australia from station to station shearing sheep, grading, bundling and baling wool. The shearing team lives a Spartan life as they move from one sheep station to the other. An average sheep shearer will shear 200 sheep in a day making approximately $5.00 per fleece. Extremely good shearers are able to shear 300 sheep in a day. This may sound like good money; however, the work is seasonal and back-breaking. It is a special breed of person who makes a living being part of a team as shearing operations will continue throughout the summer; even when temperatures exceed 40oC. Outside the Sheep Shearer’s Quarters. Packed and ready to go! By the time we arrived at the station on Friday, the sky was dark. We had no idea what the station would look like in daylight. On a frosty (Yes, there was Frost!) low lying foggy Saturday morning we awoke to a surreal setting. Through a misty morning haze sheep “Baaed” and kangaroos bounced across the sheep paddock which was speckled with an endless expanse of saltbush and various other grazing forbs and grasses. Gail commented that we had waited six months to see kangaroos bouncing in the wild. Prior to now, we had only seen this marsupial in a stationary position as they grazed in fields. We could now check another Aussie Icon off our bucket list. Being naïve, we asked Andrew if we were finally in the Outback. 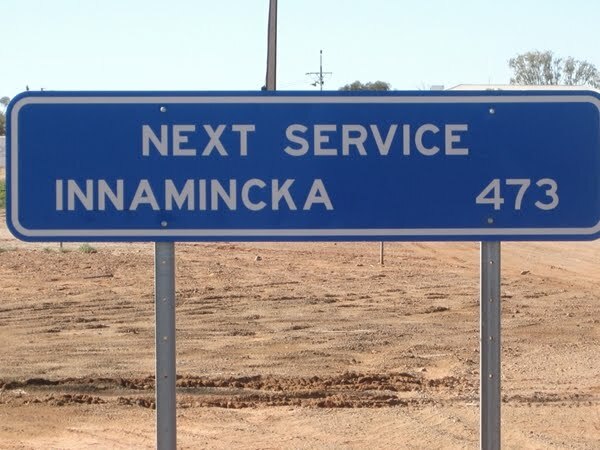 With a slight grin on his face he replied “No – the Outback starts about 15 km down the road. This is still pastoral country because outback country only applies to those areas where you can’t see the lights of your neighbour’s place anywhere on the horizon.” Given that we hadn’t seen any lights on the horizon the night before, we suspected that Andrew was having a yarn at our expense. 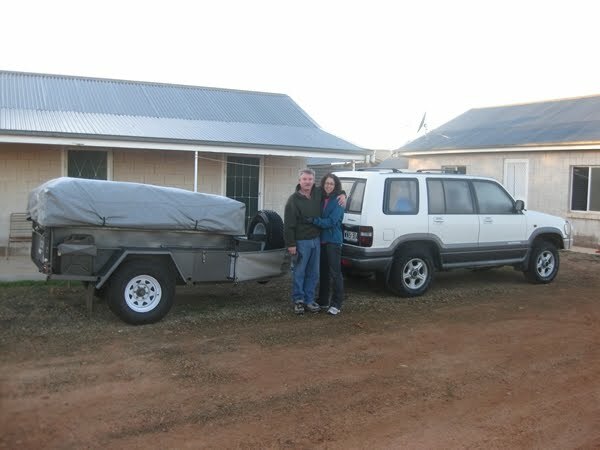 After checking tire and oil pressures in the 4X4 vehicles, inspecting the rigging on the accompanying tent trailers, and most importantly confirming that the proper UHF radio frequencies between vehicles was operational, the six of us were off on our adventure through the outback. We were advised that it was wise to travel the outback in two vehicles that are well equipped with provisions, lots of water, jerry cans of fuel and extra parts. After our weekend adventure, we now understand why it is important for vehicles to travel in pairs while journeying through the outback. The rocky road surface can play havoc with tires, frequently causing more than one flat. It is also not unusual to see road signs advising that the next fuelling station is more than 400 km away. Hence it is wise to have assistance when there is a vehicle breakdown….particularly in the summer. Andrew nonchalantly told us that the hottest temperature he had recorded on his thermometer gauge at his station was over 50oC. The Signs say it all! Our Saturday destination was a 5 hour journey to Marree. 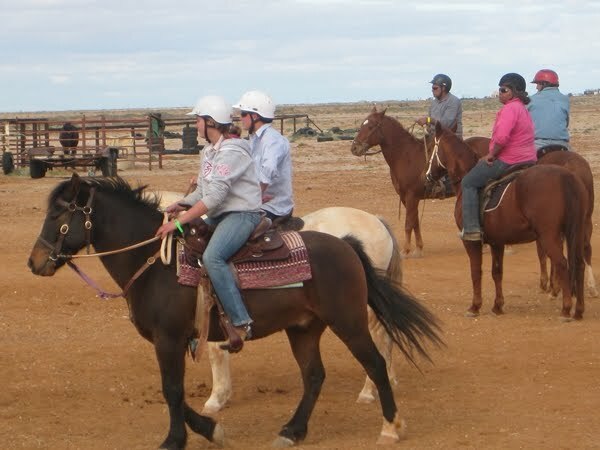 We were headed to the “Marree Horse Races” which is the annual social highlight of the year for this outback town. Established in 1883, Marree was situated at the head of the rail line. Cattle were driven down from Queensland and the Northern Territory to Marree where they were corralled and transported by rail to Adelaide. At one time, Marree was a thriving community, but after the rail line was relocated 200 km to the west in 1980, the town has subsequently dwindled down to a community of approximately 100 people. On our drive to Marree we passed a number of sheep stations, saw sand dunes in the distance, and travelled through parched desert terrain. 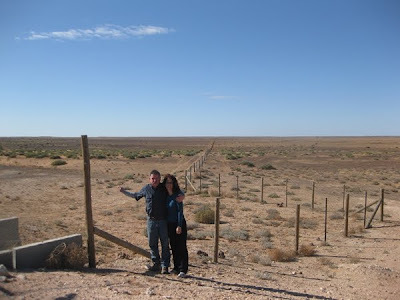 We picked our way along both rocky and dusty roads, and made our way through the “Dingo Fence”, another Australian Icon. The Dingo Fence stretches approximately 5500 km across the Australian outback. It was originally built in the 1880’s to keep Dingoes out of Australia’s fertile lands to the south east. Today, government employees travel along the fence making repairs where necessary so as to ensure that sheep herds to the south are protected from Australia’s top predator on the food chain. As we made our way to Marree, our eyes were constantly scanning the terrain in a full 360 degree searching pattern. At times, there was absolutely no relief of any kind on the landscape. Gail commented that the flat topography reminded her of Saskatchewan because you could watch your dog run away for three days. 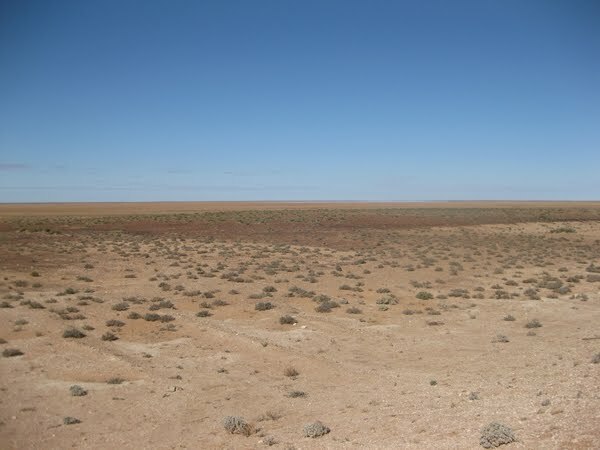 Dawn remarked that they referred to this part of the outback as “Utter Desolation”. 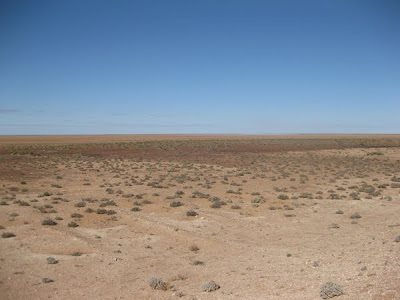 Ironically, we all agreed that this utter desolation held a certain subtle beauty and we could understand how the Outback could get into one’s blood. 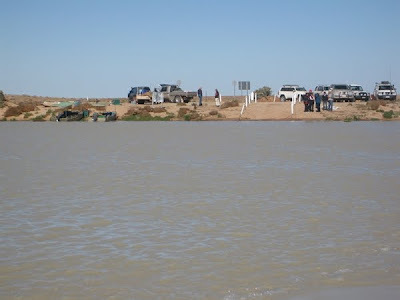 When we arrived at Marree, the races were well under way. The airstrip was crowded with private planes as people from all across the outback travelled by various modes for a social outing to Marree. Given the opportunity, a professional photographer would have been in his/her element photographing people at the races. There were all kinds of cowboy hats sitting on top of many weathered sun-drenched faces that had spent a life time outdoors. Some hats looked like they were just off the shelf from a fancy clothing store, while others had seen a “lot of hard miles and dust”. 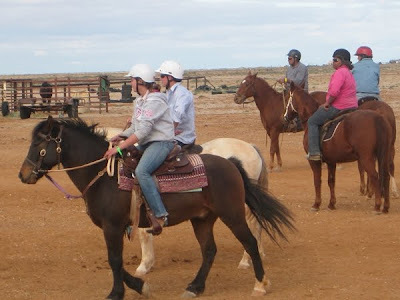 Many cowboys or Jackeroos as they are known in Australia were dressed in their “Saturday Night” best shirts, while other Jackeroos appeared dusty and grimy as if they had just come in off the ranch (or station in this case). We were surprised at the amount of money that was exchanging hands as people bet on their favourite race horse. We were told that for some Jackeroos, money was not much of an issue due to the fact that they had not been to town for months and it was simply time to party! Andrew and Joy were in their element talking and getting caught up with friends and acquaintances that they had not seen for a while. One lady was particularly interesting as she talked to Andrew in such a way that she hardly moved her lips. She seemed to talk through her teeth. When we asked about her, we were told that she was Andrew’s and Joy’s neighbour. We found out later that she lived 56 km away from their place! We were subsequently told that many people living in the outback learn to talk through their teeth as a way to cope from flies getting caught in their mouth. After having spent a summer in Kadina, this is something that we understand and can relate too. Flies in South Australia are on par with Canadian mosquitoes. While golfing at our local golf course during the summer, the flies were horrendous. They were unrelenting as they constantly sought any source of moisture such as one’s mouth, nostrils, ears and eyes. At night, the Cabaret at Marree and the party goers were in full swing. Instead of the revelry and carousing, we elected to sit around the camp fire and enjoy the winter skies. And we thought that the night skies in Kadina were incredible! Amongst a few shooting stars, the Milky Way was the main attraction. It was a blur of stars, one indistinguishable from the other. Now we know why it is called “Milky”. End of Fly Season on the Golf Course at home. 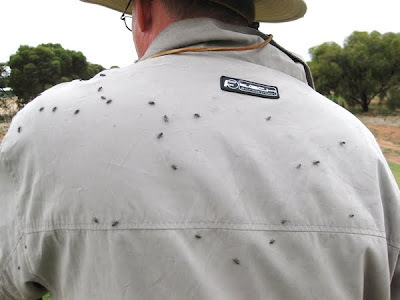 Can you imagine what the flies must be like during “Fly Season” in the outback? 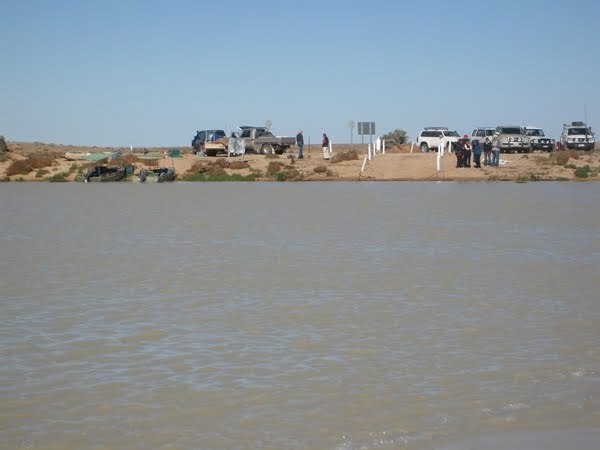 On Sunday, we went for about a 150 km drive on the Birdsville Track up to Cooper’s Creek. As far as we can surmise, travelling on the Birdsville Track would be equivalent to driving a portion of the Alaska Highway. 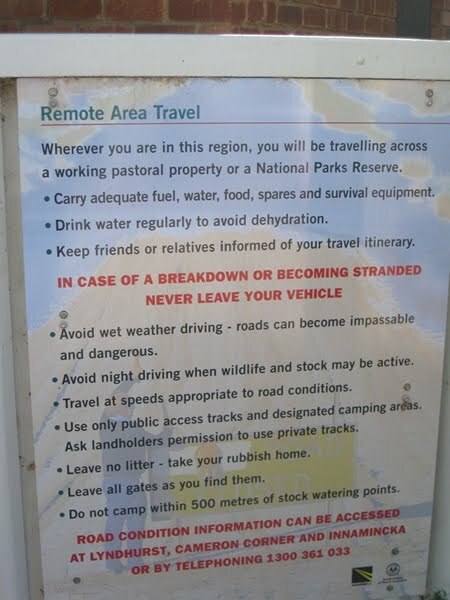 It seems that most, if not every, Australian has heard of the Track, but many have not actually travelled it. Our destination was Cooper’s Creek. Cooper’s Creek is normally a non descript dried creek bed. 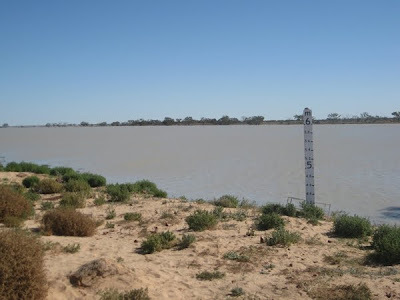 However, this year the creek was filling with water originating hundreds of kilometres to the northeast from unseasonably wet rains occurring in Queensland. The last time that the creek had water in it was in 1974. This phenomenon is considered by many Australians to be a once in a life time occurrence. Once the creek has filled with water, access across is via a ferry or “punt” as it is called here. When not needed, the punt lies abandoned next to the creek. However, once every 30 - 40 years or so, the creek floods and the ferry is put into service for about a 6 – 8 month period. For safety and weight restriction reasons, only one vehicle and a maximum of six passengers are permitted to travel on the punt. Given that there were not a lot of vehicles or passengers waiting to cross on the punt, we took the opportunity to be passengers on the ferry. As we crossed the creek, the punt operator boasted that the last time the ferry was operational, his father had been the captain. He was most proud to be carrying on the tradition. Unfortunately, we couldn’t really appreciate the significance of our Cooper’s Creek experience. In our minds, we were thinking “What’s the big deal? After all, it was only a creek with an operational ferry; something that we had seen in Canada many times before”. However, we were assured by those present that water in Cooper’s Creek was a BIG DEAL. 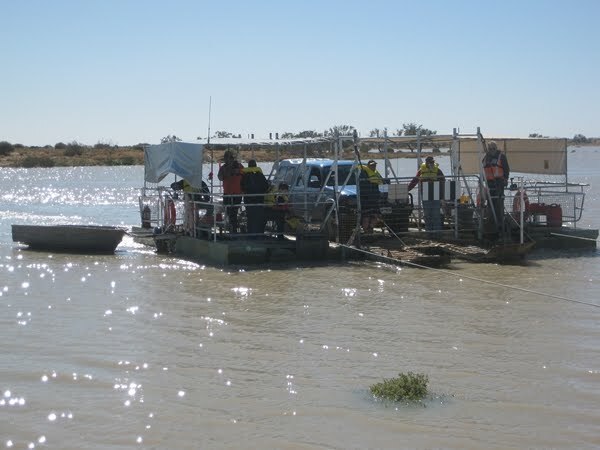 People had driven far and wide to travel on the Copper’s Creek Punt. Doug remarked that maybe 11 million Australians would love the opportunity to ride the punt while maybe only a few thousand will actually ride it while it is in operation. To the slight and humorous chagrin of our Australian partners, they laughed quietly as we were more interested in the flock of wild budgies that had migrated with the water. To us, that was really something! After all, we would never have the opportunity to see budgies in the wild in Canada. Our trip to Cooper’s Creek only confirmed our understanding that everything is relative and is to be enjoyed. 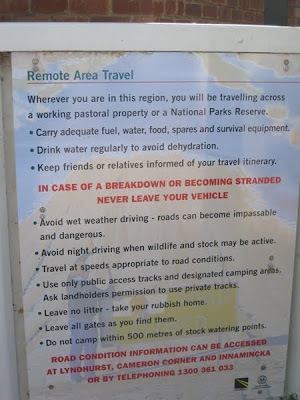 For example, a trip to the Outback was merely “Ho Hum” for our Australian friends, but was incredible for us. We know that they took pleasure in our reaction to travelling the outback equally as much as we relished their feedback to travelling the punt at Cooper’s Creek. People’s responses to experiences, no matter how different they may be, should not be dismissed; especially when shared amongst friends. While at the creek, we had to chuckle at another “Outback Experience”. A couple of private planes had flown to the creek and used the road as their airstrip. The travellers only stayed a short while, got out of their planes, viewed the creek, and then took off on their journey. On Monday, we left Marree for our return drive back to Kadina. We certainly had a fun-filled weekend packed with memories that only validates that this year of exchange is a most amazing and awesome experience. The second term of school holidays is around the corner. We won’t be entering another blog until around the third week of July; once we return from holidays. As this is now summer time in Canada, we hope you take the time to enjoy the warm weather, go golfing, sit outside on the deck or do whatever it is that makes summer so memorable for you.